As I was watching a movie the other day, Avengers: Infinity War, it made me really appreciate writers that are plotters and not pantsters. I am a pantster. I write by the 'seat of my pants' each time I sit down. I have no idea where my story will take me or where it will end up. I just have to keep writing. Plotters are just what you think they are, writers that plan out a plot. I'm sure they're different layers of plotting, too. From writing down your plot on a cocktail napkin to a full- blown storyboard equipped with photos and swatches, circles and arrows, and possibly even colorful post-it notes. What must it be like for several directors / writers / producers to be able to keep a plethora of Marvel character story-lines all heading in the direction they want when they have their own paths to take and then so many of them interweave with each other and most times even overlap each other in each movie. What a tangled web it must create. Although I can appreciate the work that goes into being a plotter, it makes me glad that I'm just a pantster. How about you? Do you write moment to moment or are you all about the index cards and thumbtacks? The next #IWSGPit is Thursday, July 19, 2018! Create a Twitter-length pitch for your completed and polished manuscript and leave room for genre, age, and the hashtag. 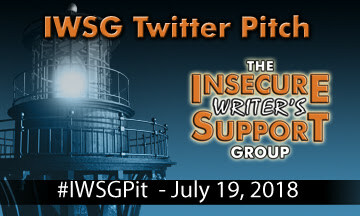 On July 19, Tweet your pitch. If your pitch receives a favorite/heart from a publisher/agent check their submission guidelines and send your requested query. They've certainly planned out the Marvel Universe well. I have to plot or my stories would wander out into the desert and never return. LOL - I'm about timelines and character sheets. It was the only way to juggle five stories following the same characters that overlapped in time. I'm a panster trying to learn to plot a bit to help me actually finish. Can't wait until I have something and can try the twitter pitch parties. I have plot points in my head, but that's as far as I go. Hi, Heather. I enjoyed your post about the debate over being a plotter or a pantster. I am a pantster at first with anything I write, at least when I start. I may have a "plot line" of two or three sentences, an overarching idea, but that's it. Usually I have to write a bit before what I want to say becomes clear, and then I become more of a plotter Thanks for all the information on the Twitter Pitch. I won't be participating, but I appreciate all the effort that goes into setting up this opportunity for IWSG members and the opportunity itself. Good luck with the Twitter Pitch. I'm a plotter that gets diverted by my characters - especially when they want another victim. Whether my current WIP mystery in finished in time for the Twitter pitch depends on real life - but I might plot it into my schedule. Thanks, Heather. L. Diane - I've never been able to come up w/ character sheets, but its a great idea. Pat - Nothing wrong with that! Fundy Blue - Plot lines sound like a good start! Roland - You have to listen to your characters! My first two books and several short stories I wrote as a pantster! Now I am writing a memoir. Not my own, but someone else's. SO for this I am plotting. But not crazy. Just an outline of the stories and their time frame. I still have some creative panstering, but it is followed in a loose outline. Yay for another twitter pitch! It is a great way to reach out to publishers and agents. I was asked by a few agents and publisher to submit my stories, but sadly they passed, but I am hopeful for the next one. At least I know my pitches are working! You got me at a tender moment. I'm a plotter through and through who is seriously considering panstering my next MG. But boy, jumping without my net is scary. I'm a pantser too. I love the surprise of how the twists and turns come and exploring the story as it unfolds. I rarely pant. Mostly plot. With that said, I know that my planning may take a back seat if something cool comes on the page that I didn't plan. Michael - Good luck on the memoir! That sounds challenging. Keep sending out those pitches! Mirka - It really is scary, but the only way I know how to do it! Best of luck! Christine - And you've had some great twists and turns! I use to be a pantser but I'm a plotter now and it helps me write faster. I go off script a lot but I get to the end quicker. I'm definitely a plotter. I take extensive notes, make outlines, create character family trees, and make idea boards. It gets a little crazy sometimes, but I need to know where the story is going, or I won't finish it. I'm a pantser when it comes to flash fiction. But for longer projects, there has to be some sort of structure. GDPR, the IWSG, and YOU!